RIFLE-LIKE ACCURACY FROM YOUR RIFLED BARREL SHOTGUN. 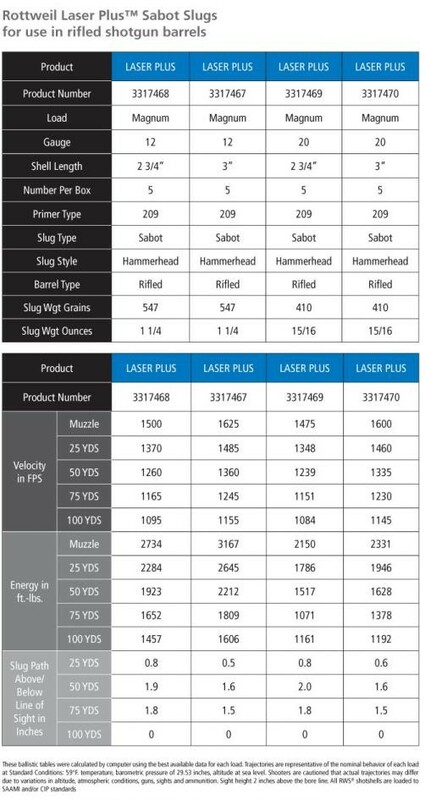 With Laser Plus™ Sabot Slugs, you’ll hit your target with more consistent accuracy and power, at greater distances than ever before. A custom non-discarding polymer sabot rides locked to the slug – providing a more stable flight from the moment it leaves the barrel to when it impacts the target. More stable flight means much greater accuracy. 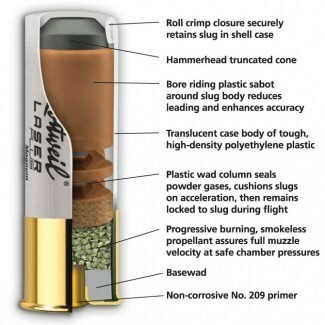 ROTTWEIL LASER PLUS SABOT SLUGS GIVE YOUR RIFLED BARREL SHOTGUN LASER-LIKE ACCURACY AT EXTENDED RANGES. The splined interior walls of the Laser Plus sabot capture the rotational spin of the barrel’s rifling, transferring that rotational spin directly to the lead projectile, so there’s no slippage. The slug itself features a truncated cone which reliably expands up to 1.5” in diameter delivering unequaled accuracy and terminal ballistics. Hunting with your rifled barrel shotgun will never be the same. Federal, State or Local law may restrict this product availability from Hastings Distribution, LLC. We do not authorize or grant the right to purchase this product which may be regulated in your area. You must be 18 to purchase shotshell ammunition. Persons with a legal disability may be restricted from purchasing certain items as defined under 18 U.S.C. 922(d)(1)-(9). When purchasing from Hastings Distribution, LLC, you warrant that you have read this information, are of legal age and fully compliant with all regulations that might apply. All ammo ships via the manufacturer and sometimes can take several weeks before your order is received. Check with your state for additional regulations. In order to comply with all laws, you may be required to provide us additional documentation prior to your order being completed. If you are considering ordering a barrel and ammo, we would appreciate you making two separate orders. They will ship from two different locations.